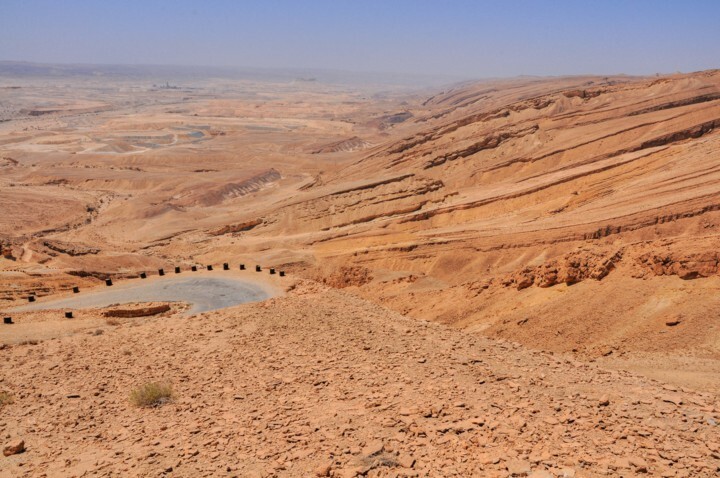 Ma'ale Akrabbim ("The Ascent of the Scorpions") is a scenic road connecting the Arava (Arabah) valley to the central Negev. Ancient routes traversed this steep climb. 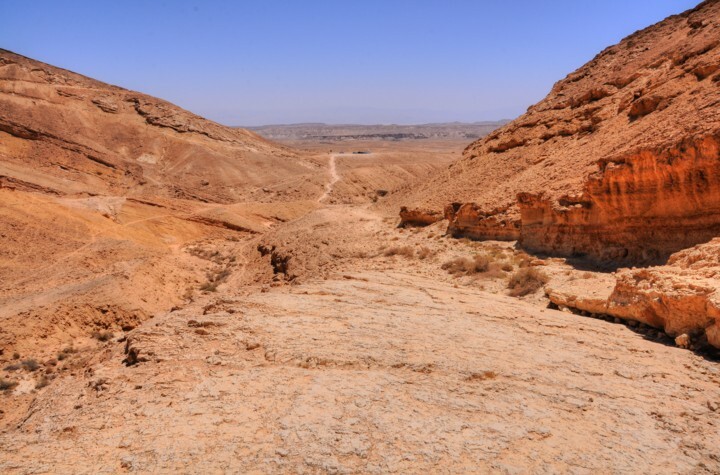 Numbers 34 4: "And your border shall turn from the south to the ascent of Akrabbim"
Ma'ale Akrabbim ("The Ascent of the Scorpions") is a scenic road connecting the Arava (Arabah) valley to the central Negev. Ancient routes traversed this steep climb, including a Roman road that was carved into the rocks. Ma'ale Akrabbim is located along and near route #227, which starts from the intersection of road #206 (southeast of Dimona - thanks for H&R Bass for the correction) to Ir-Ovot (Biblical Tamar) on Highway #90 (the World's lowest road). This British-era road, used today as a scenic road, is located on the eastern side of Nahal (Stream) Gov, as marked on the aerial view on the right side. Notice the snake-like design of the road below the marker on the right. The Roman ascent is on the western (left) side, connecting Rogem Zafir (on the bottom) to Horvat Zafir (on top), then continues towards Mamshit. Ma'ale Akrabbim is an ancient route that connected the north to the south, before and during the Biblical times. Its route may have followed Nahal Gov or the present location of the road. Tribe of Judah: The border of the tribe of Judah included the ascent (Joshua 15 1-3): "This then was the lot of the tribe of the children of Judah by their families; even to the border of Edom the wilderness of Zin southward was the uttermost part of the south coast. And their south border was from the shore of the salt sea, from the bay that looketh southward: And it went out to the south side to Maalehacrabbim, and passed along to Zin, and ascended up on the south side unto Kadeshbarnea, and passed along to Hezron, and went up to Adar, and fetched a compass to Karkaa: ". Amorite area - After the conquest of Israel, the Amorites held the area. Judah's border reached only to Aro'er, north-west of the ascent, as seen in the map. (Judges 1 33-36): "And the Amorites forced the children of Dan into the mountain: for they would not suffer them to come down to the valley: But the Amorites would dwell in mount Heres in Aijalon, and in Shaalbim: yet the hand of the house of Joseph prevailed, so that they became tributaries. And the coast of the Amorites was from the going up to Akrabbim, from the rock, and upward". A Biblical map is illustrated below, with the ancient path crossing the Ascent of Akrabbim towards Tamar (Ir-Ovot on highway #90). 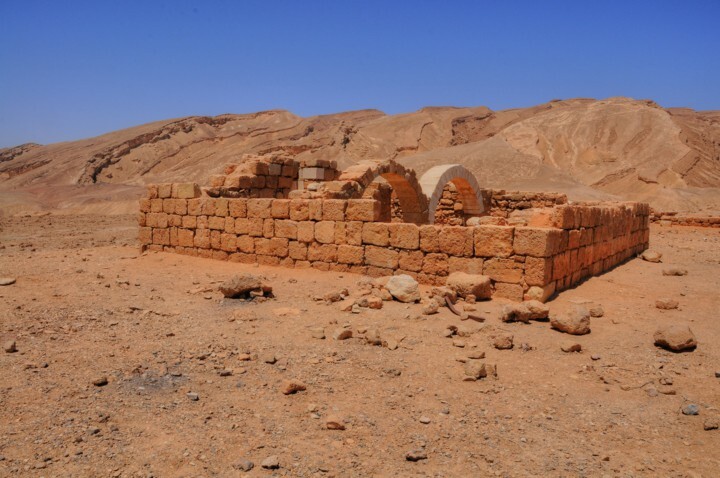 Scholars suggested different locations of the Biblical Ma'ale Akrabbim, but most agree on this location (named in Arabic as Nagb es-Sfar, and renamed in Hebrew as Zafir). 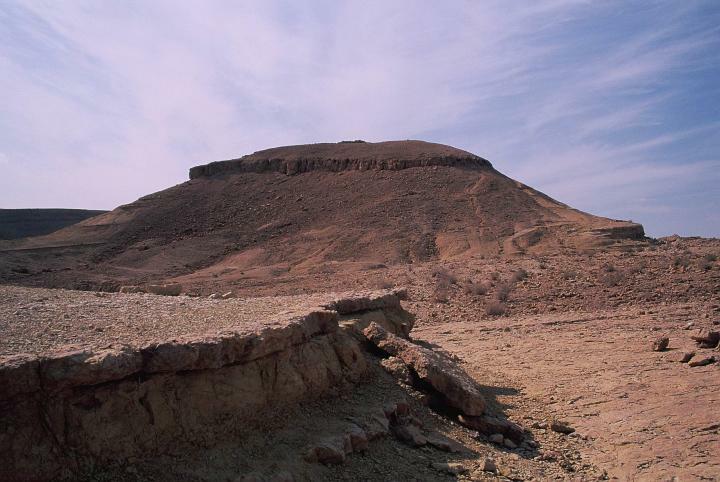 Walter Mattfeld concluded after a comprehensive review that this is indeed the location of the Biblical site: "I finally have "accepted" that the Israeli scholars are correct, the ascent of Akrabbim is to be associated with Nagb es-Sfar, "the ascent of Sfar" (Safar/Safa/Sfai)". Judah Maccabee fought against the Edomites after liberating Jerusalem, at about 165BC (Maccabees 5): "When the goyim all around heard that the altar had been rebuilt and the sanctuary dedicated as it was before, they became very angry, 2and they determined to destroy the descendants of Jacob who lived among them. So they began to kill and destroy among the people. But Yehuda made war on the descendants of Esau in Idumea, at Akrabattene, because they kept lying in wait for Israel. He dealt them a heavy blow and humbled them and despoiled them". 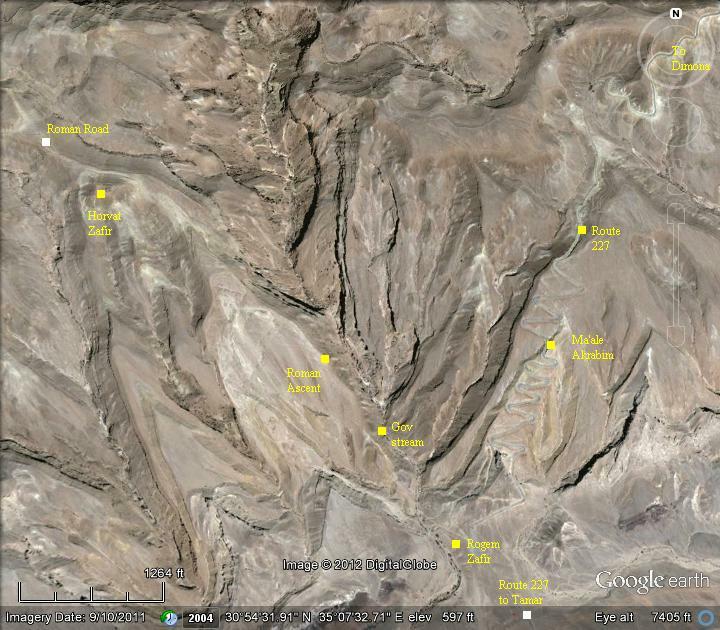 The conquest of this strategic mountain pass was important to control the passage to Edom. The ascent of Ma'ale Akrabbim was also part of the Nabatean trade route called the Incense & Spice route. The Nabateans originated from Arabia, where they have been nomadic tent dwellers. They prospered from the operation of the Incense and Spice route, and established stations and cities along the route. This commercial enterprise started around the 5th or 4th C BC, and made these merchants rich. Their new capital city in Edom, called Petra, based on the Greek word for Rock. This route connected the east (Yemen and Oman), through Arabia, via the Nabatean capital city Petra, to the port cities on the shore of the Mediterranean Sea - Gaza, Raphia, Rhinocorura (al Arish). 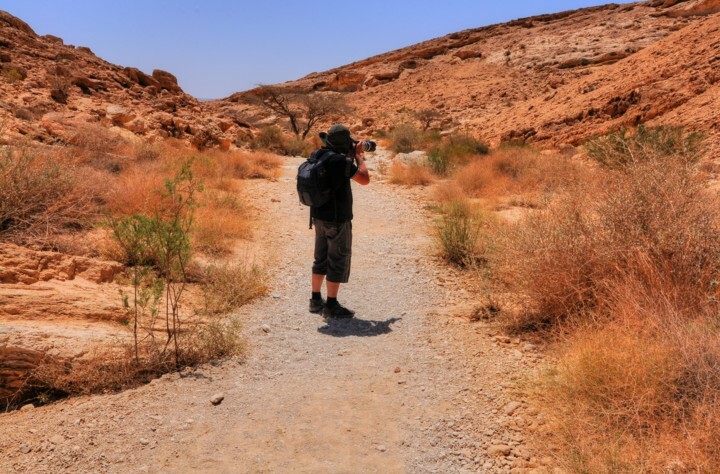 The road was used by the Nabateans to export the incense and spices from southern Arabia and the Far east to the Classic world of Greece and Rome. 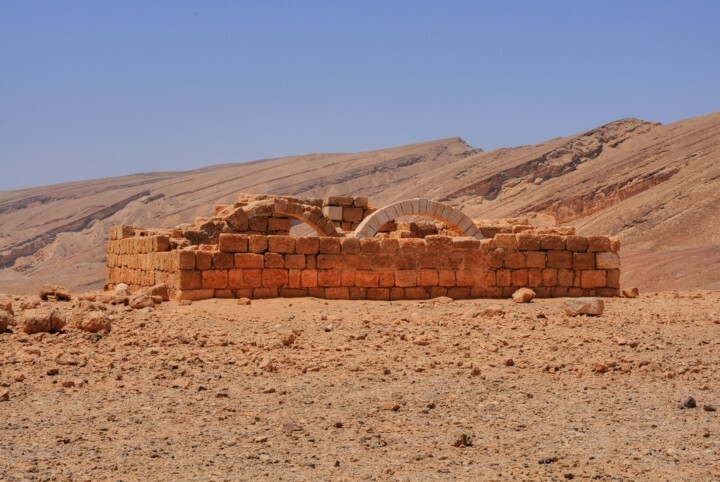 In order to support & protect the Incense route, the Nabateans established stations and fortresses along the road. The stations and fortresses along this section included a lower location (called Rogem Zafir), an upper location (called Horvat Zafir) and nearby fortress (called Mazad Zafir). 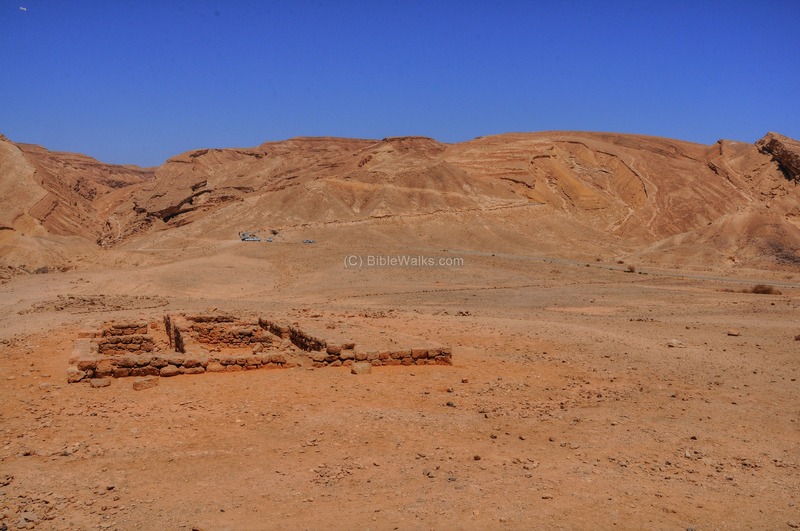 These were built during the early Roman period by the Nabateans. After the Romans annexed the Nabatean country (106AD) they improved the road, and it was in use during the late Roman and Byzantine periods. After the Persian or Arabian conquest (7th C) the road and the sites were ruined. 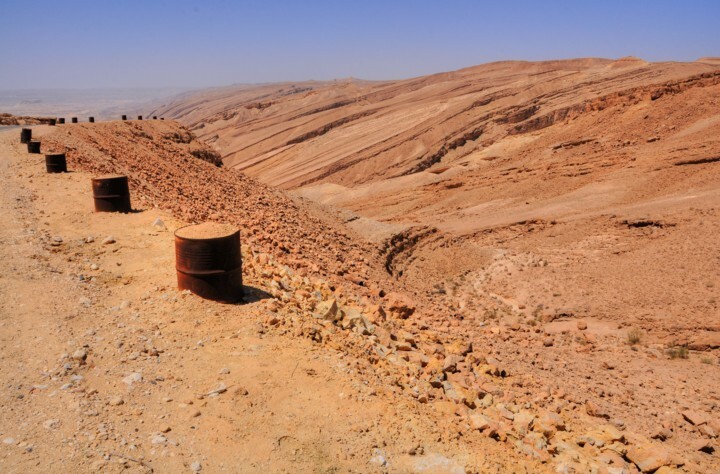 The modern road (#227) on the eastern side of Nahal Gov was initially constructed during the British Mandate in 1927, in order to connect their two desert police stations (in Mamshit and Hazeva). After Israel's independence it was enlarged to double lanes and also paved with asphalt (1950). In 1954 a bus from Eilat was attacked, and 11 passengers died and wounding 2. After this attack, a new road was constructed (completed in two phases - 1953 and 1955) using an alternative route from Beersheba via Dimona to Sodom, located 13KM to the north. 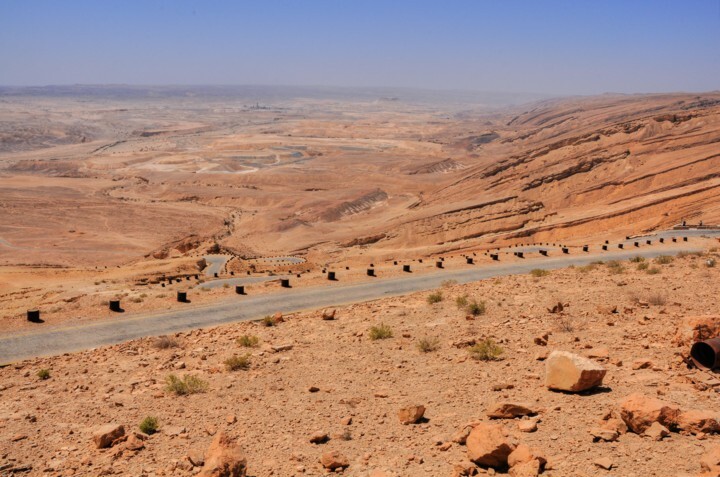 A second route was then opened in 1958, passing thru the Ramon crater. Road #227 is now open as a scenic drive, but be careful and drive slowly. The road from Dimona to Oron, numbered "227", follows sections of the ancient Biblical and Roman road. Before reaching to the valley of Nahal (stream of) Gov, the road winds around the valleys in a small slope. At one of the curves is a sign directing to the Makhtesh Hakatan ("small crater"). Another view of the mountains, south east of the road, is seen below. 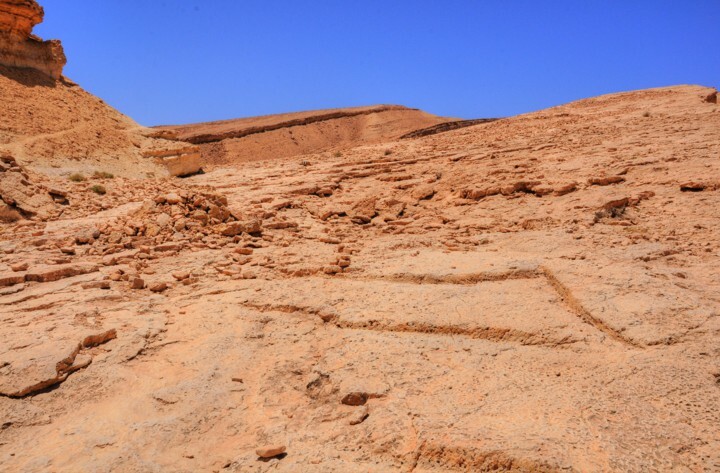 Notice the multiple layers of sedimentary rock formations, which were created by the geological process described in the page of Makhtesh Hakatan. The British old road descends 320m down the hill, from the altitude of 403m at the crossing of the upper Gov stream down to the altitude of 75m at the bottom of the ascent. The total aerial length is 2KM, which is a 16% slope overall and 24% at the central section. Reasonable slopes are up to 15%, so in order to lower the slope of this steep descent, the road used a serpentines (=series of curve) design, where the road looks like a serpent (snake) rather then going down straight. This road is based on 18 serpentiles, which forces a slow but relatively safe way down. On the side facing the abyss are barrels filled with cement. 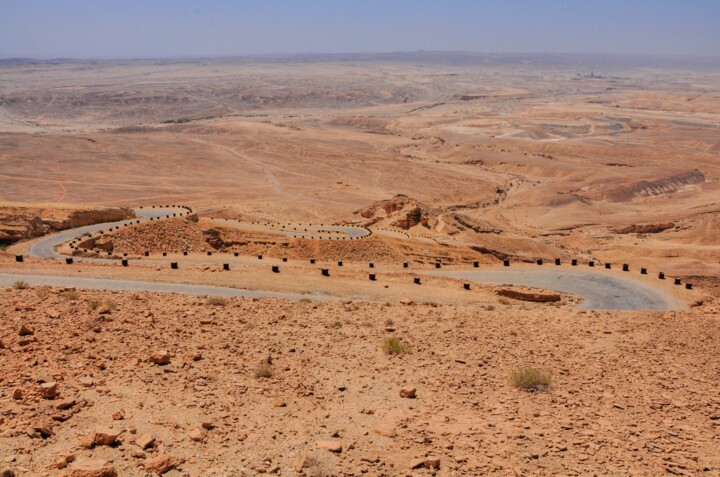 The road was initially constructed during the British Mandate in 1927. After Israel's independence it was enlarged to double lanes and also paved with asphalt (1950). Today the road is used for a scenic drive and is not in modern standards, so you must drive safe and slow. 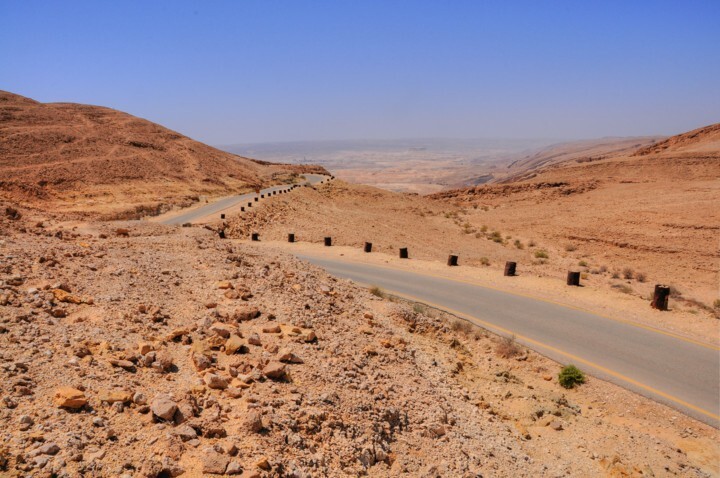 The road used to serve the traffic going to and from Eilat. The conditions and design of the road required a slow and careful descent. This is probably why terrorists from Jordan used it on March 17, 1954, to ambush a bus arriving from Eilat, killing 11 passengers and wounding 2. 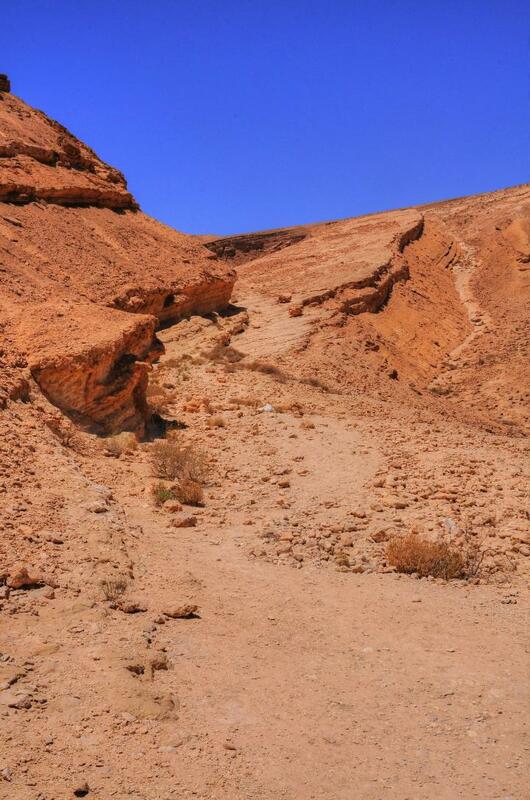 Although few drivers take this route, it offers an option of a unique scenic drive down to Eilat. Another view of the road is seen here. On the right side of the curve, where the diagonal lines of the mountain are seen, is the route of the Roman road. In the far background is the valley of Zin, the location of the phosphate industrial zone. The next photograph shows a closer view of the location of the Roman road, which follows the lines of the mountain on the western side of Gov stream. Nahal (Stream of) Gov starts from the upper side of the ascent, then loops around and reaches the lower side near Rogem Zafir. It is also a recommended hiking route of about 3 hours from top to bottom, with some steep descents using ropes and ladders. 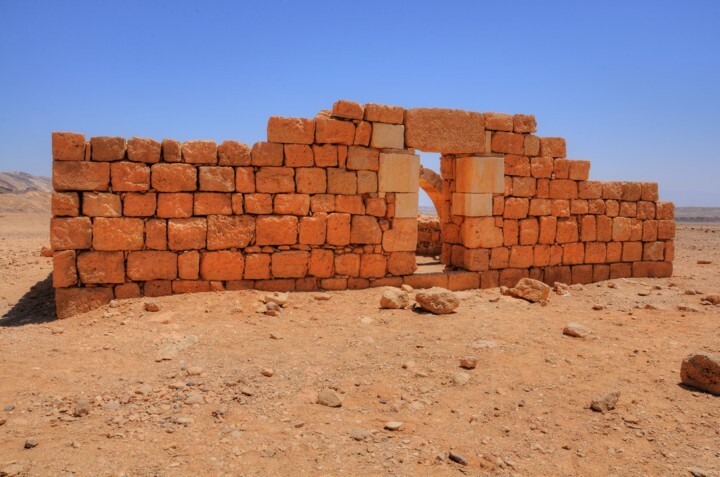 The site was excavated, and two structures were reconstructed - a Roman/Byzantine fortress and a khan (caravanserai), which guarded and hosted the travelers along the Roman route. The ceramic findings included Nabatean pottery dated to the Early and late Roman periods. 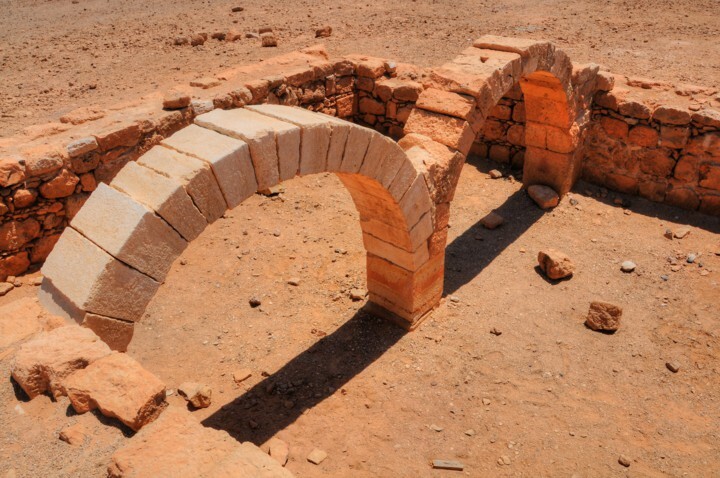 The deign style - arches supporting the second floor, and a structure based on stone, are typical of the Nabatean cities. The Roman Ascent starts from the same location of the British road at the lower section near Rogem Zafir, but rises on the western side of Gov stream - at direction north-north-east - up to the fortress of Horvat Zafir. The following diagram shows the path of the Roman ascent. The total length of the road, including the curves, is 2.5km. The aerial length is 1600m from start at the bottom (Rogem Zafir, at an altitude of 90m) to the end of the ascent (Horvat Zafir, at an altitude of 440m), with a height difference of 350m and average slope of 22%. The lower side of the ascent starts from Nahal (stream) Gov. The path goes up the side of the hill, following the western side of Gov. This same spot is also seen below looking back to the starting point of the ascent. The parking place is just beyond the valley. You can see that the surface is flat and easy to walk through. A the lower section are just a few steps, such as these in the next picture. The carved steps are designed for camels, which were the primary animals used in the incense route. The steps are more visible on the higher level of the ascent. 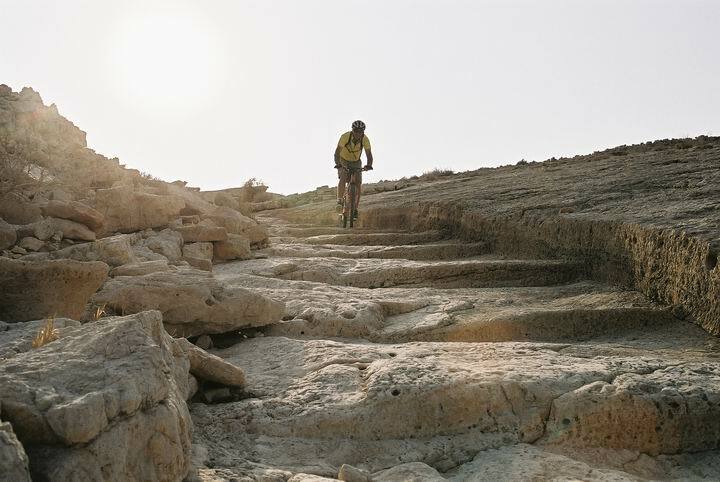 The following photo (courtesy of Dr. Hezi Yizhaq and Ilan Shoham) shows a biker descending the ancient rock-cut Roman road Ma'ale-Akrabbim. This section is located on the upper side of the ascent. 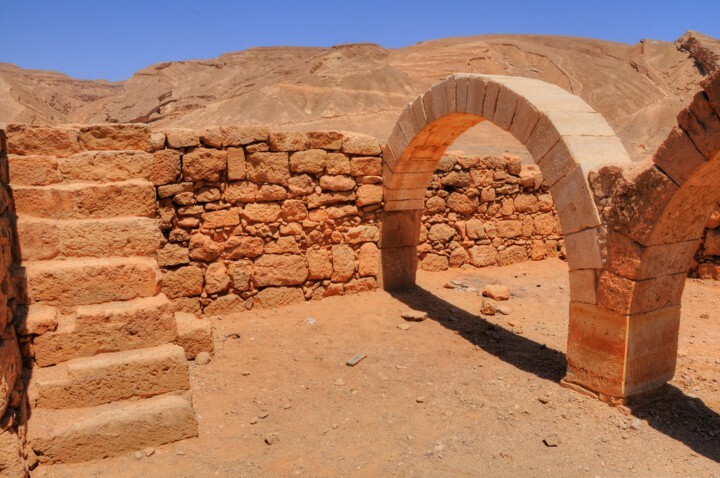 Horvat Zafir is at the end of the Roman ascent (photo courtesy of Dr. Hezi Yizhaq and Ilan Shoham; Ilan is Webmaster Rotem's second cousin). 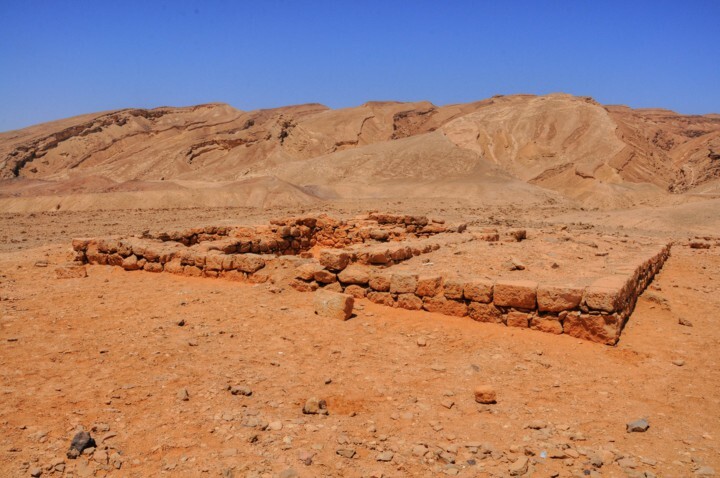 It is part of the chain of fortresses that guarded the Roman road from Petra, thru Mamshit to the west and north of Israel. 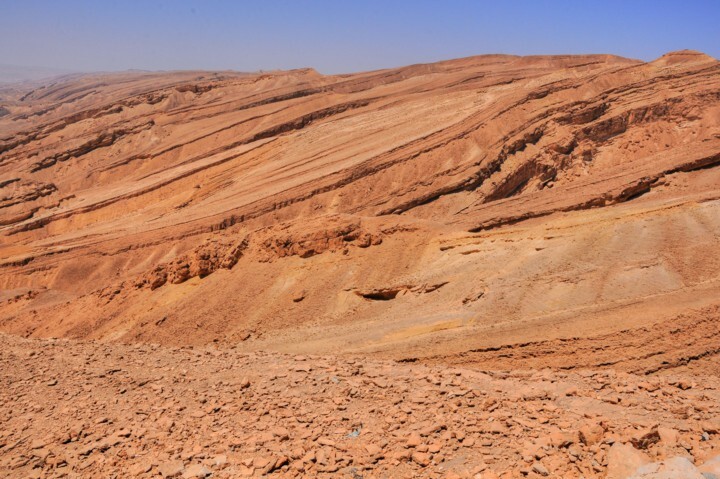 A Panoramic view from the old road looking south towards the valley of Zin is shown below. If you press on the picture below, a panoramic viewer will pop up. Ma'ale - Hebrew: Ascent (Aleh means: rise). Proposals for the locations of the Ascent of Akrabbim,..